Traditional religious beliefs in north-eastern Georgia are based upon a pantheon consisting of an all-powerful god called morige ghmerti served by divine or demi-divine vassals called j'vari ("cross") or khat'i ("image, icon")—some local, others more powerful and widespread. Some of these vassals are powerful divinities in their own right, e.g. St George, Kopala, Kviria, Iakhsar, Pirkushi, &c. Many others are specific to a particular village, place or clan, and are often local incarnations or variations of the more important and naturally more "universal" divinities: the many shrines devoted to St George, for example, worship many different incarnations of the saint—e.g. the shrine of Giorgi "Balaurtisa" in Shtrolta (Tusheti), of Giorgi "Boslovni" in Khakhmat'i (Khevsureti), of Giorgi "Karismezobeli" in Chimgha (Arkhot'i), of Giorgi "Naghvarmshvenieri" (again in Khakhmat'i), of Giorgi "Ts'q'arostauli" in Ukanapshavi (Pshavi), of Giorgi "Okros Mshvildosani" in Chirdili (Khevsureti), &c.
The kadag was the man to whom a divinity had revealed itself, having chosen him to be its messenger and mouthpiece on earth, a channel through which it could make its wishes known to its followers, to its community of believers (G. ყმა, q'ma, "slaves"). The kadag was, in a word, an oracle: 'the instrument, agency, or medium through which the gods were supposed to speak or prophesy', 'a vehicle or medium of divine communication; a person who expounds or interprets the will of a god' ("oracle, n.", OED). Through its kadag, a divinity could, for example, order his "slaves" to go to war and attack an enemy; order them to seize the land of so-and-so as punishment for an offence; "advise" someone to bring a particular kind of offering in order to secure the recovery of an ill family member; &c. When the kadag was possessed, it was the divinity itself speaking, but the divinity would use words belonging to the sacred language of the gods—the j'vart ena, the language of the cross. ჰაი! ჰაი! მე ორ მთავარ–ანგელოზი, მე მაქვს ძალიდ’ შაძლებაი! | ჩემთ ყმათ აღარაად გავაჩნიორ! | მხარი მხარს გამისწორესად კისერ კისერს! | მათრევენ სიმურშიად’ რიოშანში! | აღარაადვის გავაჩნიორ, მაგრამ მე აისივ მთავარ–ანგელოზი ორ, მე აისივ ძალიდ’ შაძლებაი მაქვ! | ჩემ ყმათ ურჩევ, რო ჭკვით იყვნან! | მე ნუ გადამაგდებენ თორე ვანან! | ჩემს წესს მე არ დავიყრი, რაიც ხთისგან მაქვ მალოცვილი! hai! hai! me or mtavar-angelozi, me makvs dzalid' shadzlebai! | chemt q'mat agharaad gavachnior! | mkhari mkhars gamists'oresad k'iser k'isers! | matreven simurshiad' rioshanshi! | agharaadvis gavachnior, magram me aisiv mtavar-angelozi or, me aisiv dzalid' shadzlebai makv! | chem q'mat urchev, ro ch'k'vit iq'vnan! | me nu gadamagdeben tore vanan! | chems ts'es[-]s me ar daviq'ri, raits khtisgan makv malotsvili! 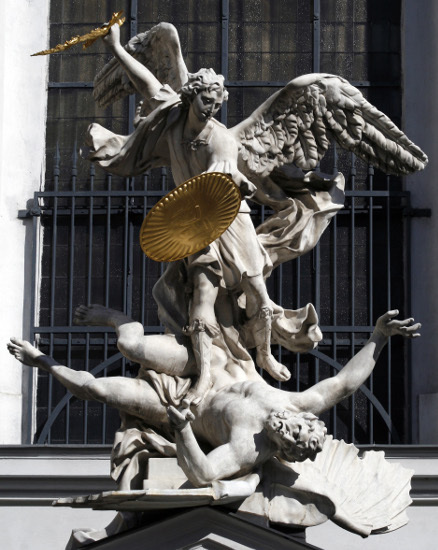 The "European" Archangel Michael (as opposed to the north-eastern Georgian one) slaying Lucifer above the pediment of St Michael's Church in Vienna. Sculpted by Lorenzo Mattielli (c.1683-1748), this representation of a wingèd, martial Archangel Michael smiting "enemies of the faith" with his flaming sword and trampling them underfoot is probably very close to the north-eastern Georgian peoples' conception of a j'vari or khat'i. Indeed, it is almost certain that their conception of their divinities was largely borrowed from Christian representations. Hai! Hai! I am the Archangel, I have strength and power! | My slaves no longer respect me! | They have levelled the arm to the arm, the neck to the neck [i.e. they consider themselves equal to the divinity, they have lowered me to their level]! | They are dragging me into soiled waters! | I am no longer different from others, but I am nonetheless the Archangel, I nonetheless have strength and power! | I advise my slaves to be wise! | May they not treat me without respect, otherwise I will punish them! | I will not renounce my rule, for I hold it from the heavens! The meaning of these lines would be almost incomprehensible to a speaker of modern Georgian: 'მათრევენ სიმურშიად’ რიოშანში', matreven simurshiad rioshanshi, for example—'they are dragging me into soiled waters'—would normally be written 'მათრევენ უწმინდურ წყალში', matreven uts'mindur ts'q'alshi. And that is precisely it: some of the words in this divine communication make no sense in Georgian, for they belong to the "language of the cross" (Georgian: ჯვართ ენა, j'vart ena). According to the works of various ethnographers (e.g. Mak'alat'ia, Charachidzé, Ochiauri, &c.), the language of the cross was a "secret" language spoken by the pagan divinities of north-eastern Georgia (in theory) and by their clergy i.e. their oracles, their priests, &c. (in practice). As a language, it essentially seems to have been the Khevsur (or Pshav or Tush, &c.) dialect of Georgian peppered with archaic, metaphorical or invented words; and in terms of having been a "secret", sacred language, the j'vart ena cannot have been particularly obscure, or else the congregation would not have been able to understand the wishes of their divinity. That said, Ochauri's list of words is a very exciting and unique compilation. Many thanks to Prof. Kevin Tuite of the Université de Montréal for going through the list and correcting mistakes and adding some details. The order is:—'["cross-language" term(s)]' = [modern Georgian term(s)] // [transliteration of "cross-language" term(s)] = [English translation(s)]. Ochiauri occasionally inserts [ || ] between two "cross-language" terms, e.g. 'ვერცხლის ბურთვი || ღილი'; this is usually to distinguish the Khevsur and Pshav dialects from each other. This list also includes a few j'vart ena words found in Donald Rayfield's (ed.-in-chief) legendary Comprehensive Georgian-English Dictionary (London: Garnett Press, 2006), e.g. 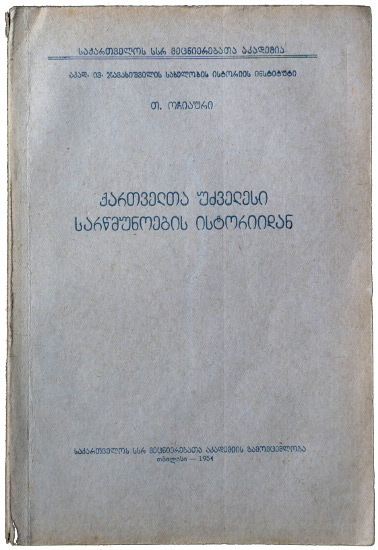 'ტახტი', 'ყვირალი', &c.
An important detail: Georgian—and the "language of the cross", naturally—use the same words 'ჯვარი' (j'vari, "cross"—as in 'the Christian cross') or 'ხატი' (khat'i, "image, icon") for both a divinity and its shrine. St George, for example is a j'vari in whose honour the peoples of north-eastern Georgia (among others) have erected many j'varis. The words "j'vari" and "khat'i" can thus refer to either the divine in spirit form or to the physical shrine built in its honour; 'a man serving the khat'i' and 'one of the khat'i's servants' can mean quite different things.